There are two ways companies deploys web applications to the cloud: PaaS and IaaS. With Platform as a Service you usually deploy your applications to the vendor's platform. Infrastructure as a Service is the basic cloud-service model: you get servers, usually vms. We started auth0 using Heroku's Platform as a Service but soon we decided to provide a self-hosted option of Auth0 for some customers. In addition, we wanted to have the same deployment mechanism for the cloud/public version and the appliance version. So, we decided to move to IaaS. What I am going to show here is the work after several iterations at a very high level. It is not a silver bullet and you probably don't need this (yet?) but it is another option to consider. Even if this is exactly what you are looking for, the best advice I can give you "don't architect everything from start", this come from the work of several weeks and took several iterations but we never ceased to ship, everything evolved and keeps evolving, and we keep tuning the process a lot on the run. What's Puppet and why is so important when using IaaS? Picture yourself deploying your application to your brand new vm today. What is the first thing you will do? Well, if you have a node.js application installing node will be a good start. But probably you will need to install 10 other things as well, and changing the famous ulimit, configuring logrotate, ntp and so on. Then you will copy your application somewhere in the disk and configure it as a service and so on. Where do you keep this recipe? Puppet is a tool for configuration management. Rather than an install script you describe at a high level the state of the resources in the server. When you run puppet it will check everything and then it will do whatever it takes to put the server in that specific state, from removing a file to installing a software. There is another tool similar to puppet called chef. One of the things regarding Chef that I would like to test in the future is Amazon OpsWorks. After you have your configuration in a language like this, deploying to a new server is very easy. Sometimes I modify the configuration via ssh to test and then I update my puppet scripts. There is another concept emerging called InmutableServers, it is a very interesting way and there seems to be some companies using it. Auth0 is very modularized and it is not a single web application but a network of less than ten. Every web application is a node application. Our core is a web app without ui which handles the authentication flows and provide a rest interface, dashboard is another web application which is just an interface to our core where you can configure and test most of the settings, docs is another app full of markdown tutorials to name a few. We use github private repositories because we already had a lot of things opensourced there. We use branches to develop new features and when it is ready we merge to master. Master is always deployable. We took some of the concepts from a talk we saw; "How Github uses Github to build Github". When something is ready? is a tricky question but we are very responsible and self organized team, we do pull-requests from branch to master when we want the approval of our peers. Teamcity automatically run all tests and will mark the pull requests as OK, this is a very useful feature of TC. But the most important thing we do in this stage are code reviews. with that in place we can review a living instance of the branch in a environment similar to production. Then we iterate until we finally merge. This is what works for us now, anyone of the team can merge or push directly to master and we consciously decide when we should do the pull-request ceremony. We used Jenkins for six months but it failed a lot, I had to rebuild few of the plugins we were using. 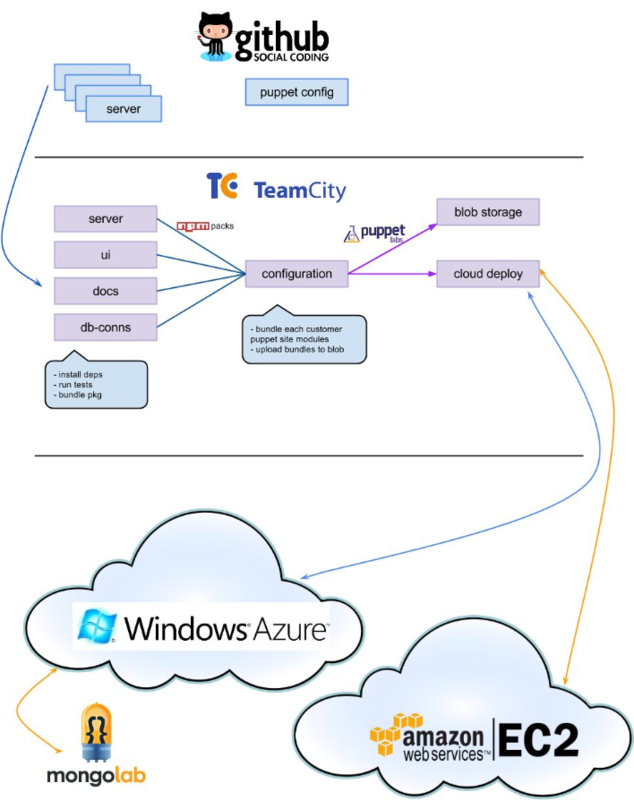 Then I had a short fantasy to build our own CI server but we choose teamcity since I had use it before, I knew how to set it up and it is a good product. 1,2,3 are very common even in non-node.js projects. In the 4th step what we do is to move all "dependencies" to "bundleDependencies" in the package.json by doing this, the npm pack will contain all the modules already preinstalled. The result of the task is the tgz generated by npm pack. auth0 the cloud version you see in app.auth0.com. It is very different from the previous one, for instance it will not install mongodb since we use MongoLab in the cloud deployment. some-customer some customers need some specific settings or features, so we have configurations with our customers name. The artifact of the configuration task is a tgz with all puppet modules including auth0 and the site.pp. All the packages are uploaded to Azure Blob storage in this stage. The next task called "cloud deploy" in the CI pipeline will trigger immediately after the config task, it updates the puppetmaster (currently in the same CI server) and then runs the puppet agent in every node of our load balanced stack via ssh. After it deploys to the first node it does a quick test of the node and if there is something wrong it stop it and it will not deploy to the rest of the nodes. Azure load balancer then will take the node out of rotation until we fix the problem in the next push. We have a backup environment where we continuously deploy, it is on Amazon and in a different region. It has a clone of our database (max 1h stale). This node node is used in case that azure us-east has an outage or something like that, when this happens Route53 will redirect the traffic to the backup environment. We take high availability seriously, read more here. When running in backup mode, all the settings become read-only, this means that you can't change the properties of an Identity Provider however your users will be able to login to your application which is Auth0 critical mission. Assembling an appliance for a customer is very easy as well, we run an script that install puppetmaster in the vm, download the last config from the blob storage and run it. We use Ubuntu JeOS in this case. I've to skip a lot of details to make this article concise. I hope you find it useful, if there is something you will like to know regarding this don't hesitate to put your question in a comment.